Feeding of Non-Ruminant Livestock focuses on the nutrition of non-ruminant livestock. The book first discusses the feeding of non-ruminants, including regulation of feed intake and intake requirements and recommendations. The text highlights the energy value of feeds for non-ruminants; protein, vitamin, mineral, and nutrition of non-ruminants; and nutrition of rabbits. The book also underscores the nutrition of growing and breeding pigs, including gilts, boars, and sows. The text describes the nutrition of rapidly growing broilers. Presentation of diets and choice of energy level; proteins and amino acids; characteristics of production system; and mineral, vitamins, and additives are considered. The book also discusses the nutrition of laying hens and turkeys. Nutrition of rearing pullets; nutrition of hens during lay; meat turkeys; and nutrition of breeder turkeys during rearing are described. The text also highlights the nutrition of ducks, Japanese quails, and roasting geese. 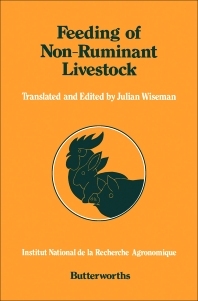 The book is a good source of information for readers wanting to study the nutrition demands of non-ruminant livestock.